Oh, oh, oh...I almost forgot to pass on information on a photograph course weekend coming up in January. Here is the link: Rocky Mountain School of Photography - Photo Weekend Charleston. 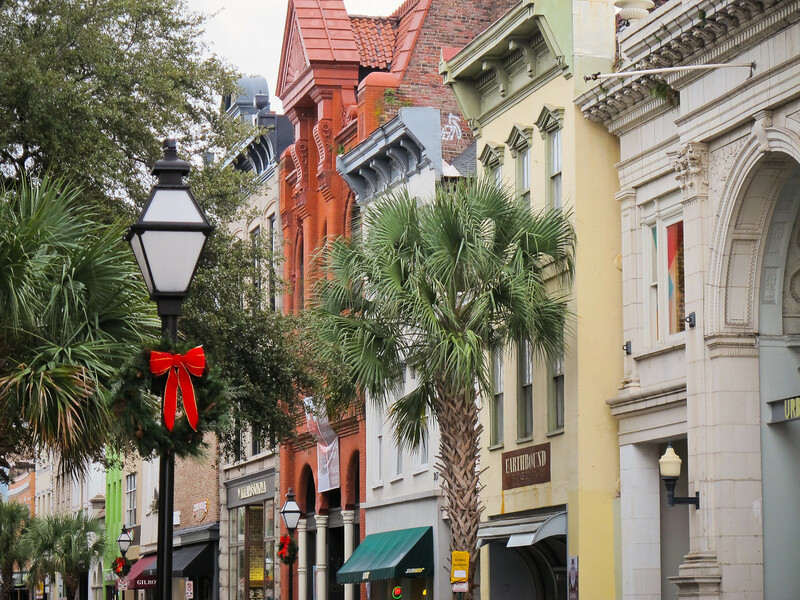 Seeing that you run a daily photo blog in Charleston, I'd like to let you know about an event we are bringing to Charleston on January 11-12 at the Francis Marion Hotel. It is a Photo Weekend led by two of our best and most long term photo instructors, Tim Cooper and Tony Rizzuto. This event is geared toward beginner and intermediate level photographers and gives people the chance to choose their own courses throughout the weekend. A fitting way to describe this Photo Weekend is equal parts education, inspiration and fun. (Well, maybe a bit more weighted to the "education" part of that). 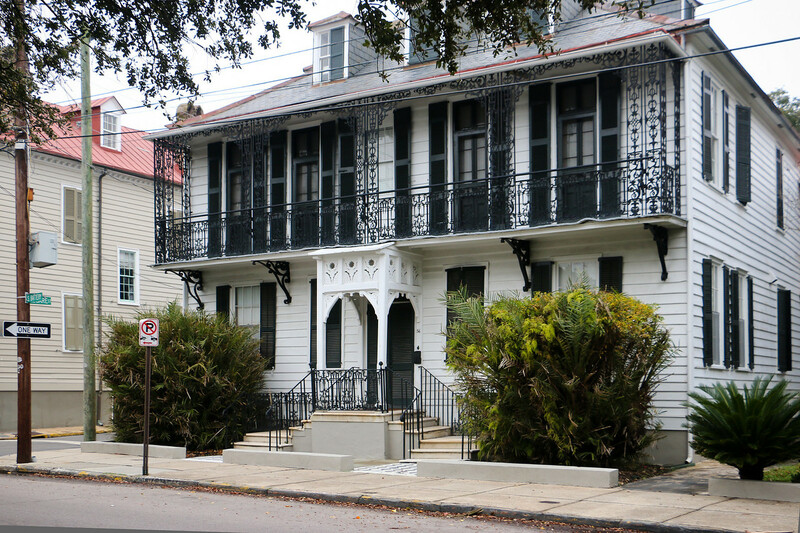 53 East Bay St., Charleston, S.C. I spotted this sign on East Bay St. and did some googling around. 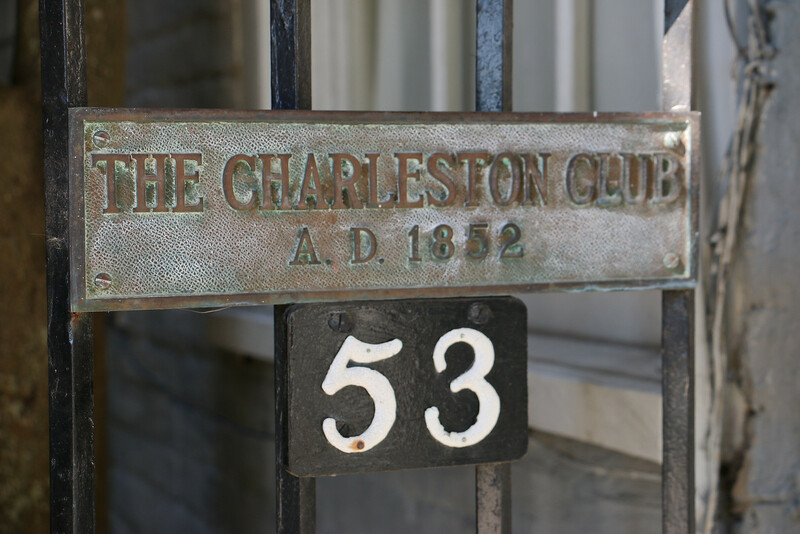 The Charleston Club was founded as a social organization in 1852 by a number of prominent Charleston gentlemen. 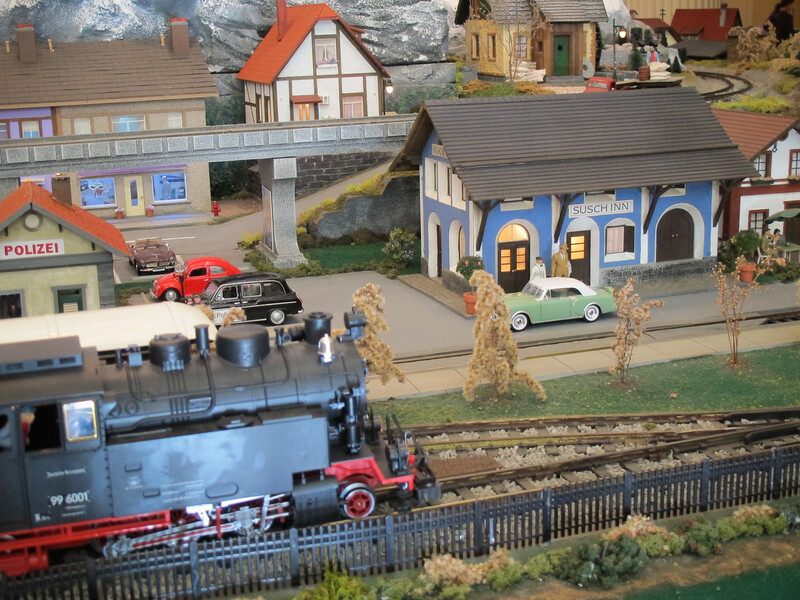 Its clubhouse, then on Meeting Street, provided an exclusive atmosphere for the convivial recreation of its members. 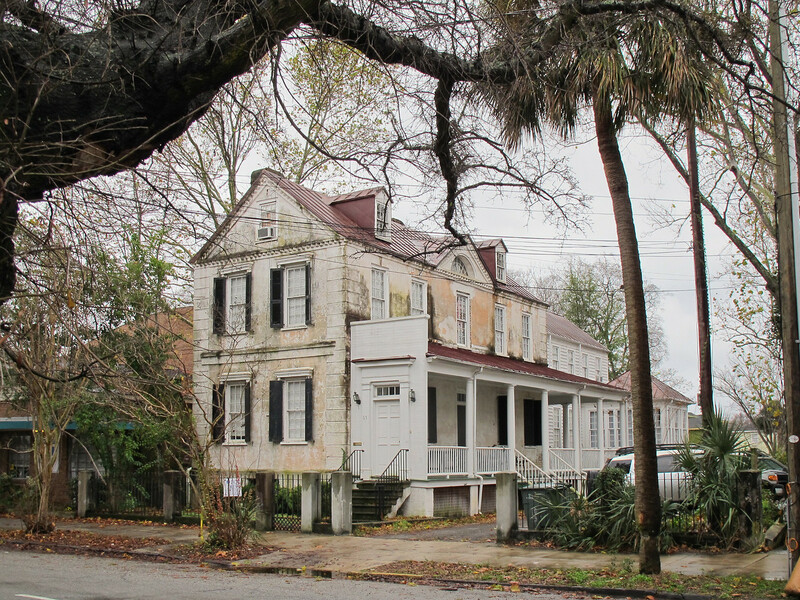 After dissolving in 1866, the club was reorganized in 1881 and over the next seventy-seven years was housed in a succession of buildings in downtown Charleston.Since 1958 it has occupied the same address on East Bay Street. Amazing what you can find online now. Here is a write up about the Charleston Club, this link includes the ingredients in the Charleston Club Punch and this article talks about the first time women were invited in in 1938. Labels: Charleston Club, East Bay St.
Teeny, tiny houses of Charleston - Beaufain St. 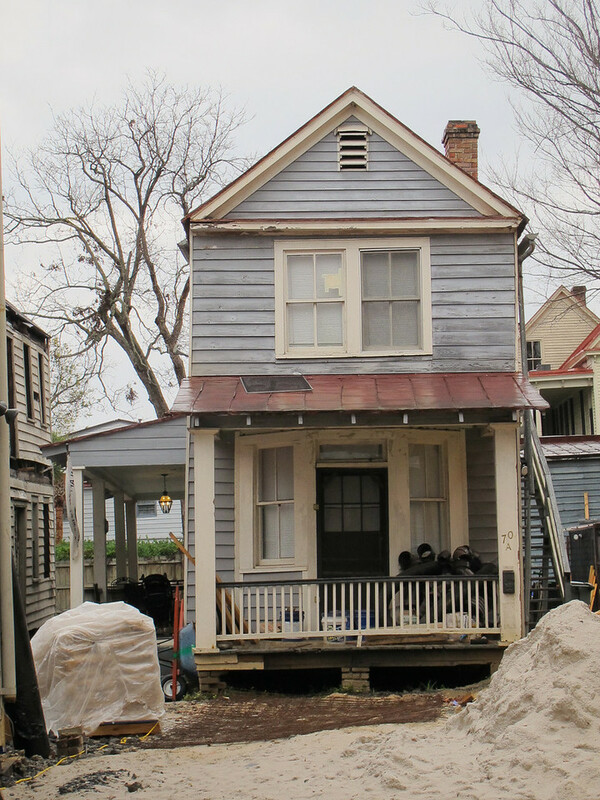 Tiny houses of Charleston, 76 Beaufain St., Charleston, S.C. Here is another wee house. 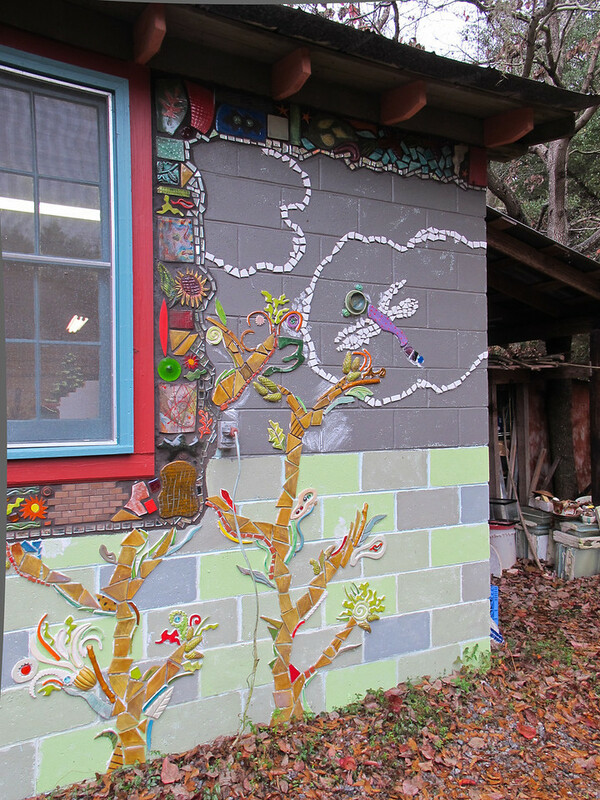 This one is really small at 650 square feet. It was recently on the market so the information is still available. 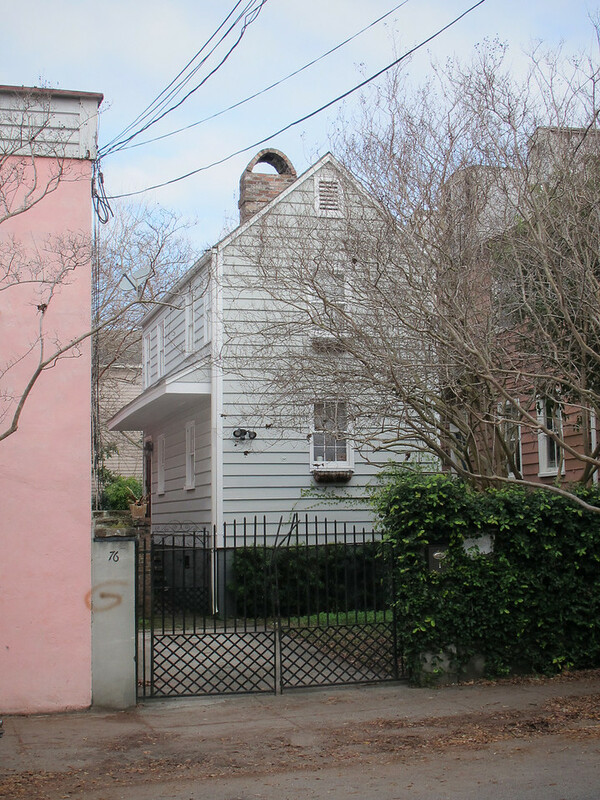 76 Beaufain St is currently off the market. 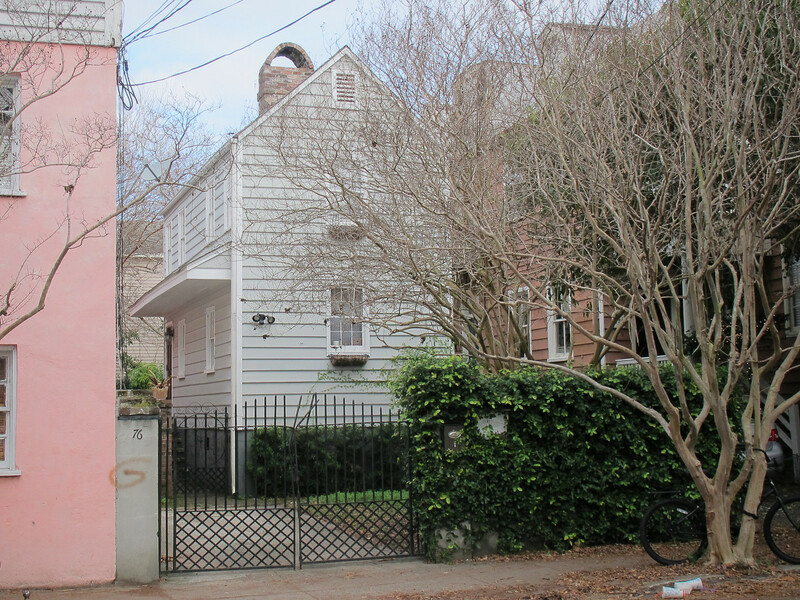 This 1 bedroom, 1 bath house located at 76 Beaufain St, Charleston, SC has approximately 650 square feet. It is was last listed for $399,000 and had a price per sqft of $613. It's been an odd day after mid-week days off. This felt like Monday and yet, now it is the weekend. Yay! I can get so much done on these quiet days at work with few phone calls and no meetings. I stopped by the mall on my way home just in case they were giving anything away after the holiday but that didn't seem to be the case. Now that I live West Ashley I get unreasonably excited about new businesses popping up in my walking area. Here are a couple of things I spotted on my after Christmas dinner walk yesterday afternoon. 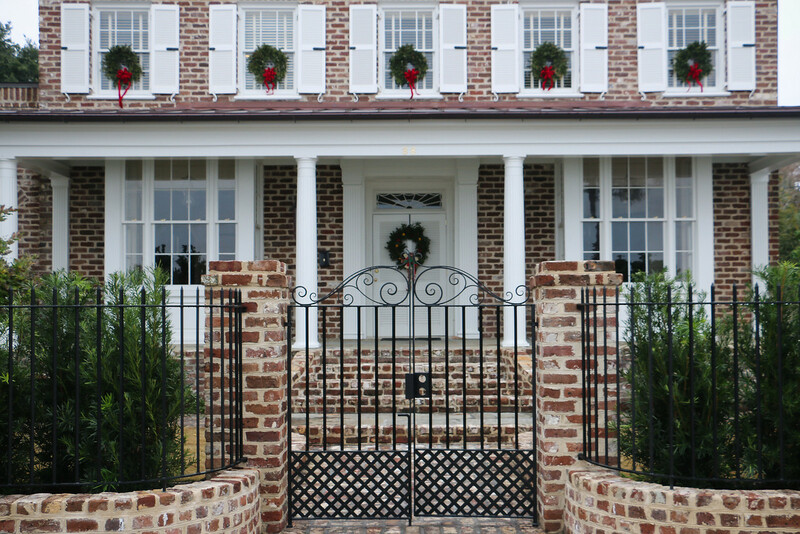 The first is a structure on Magnolia Road. 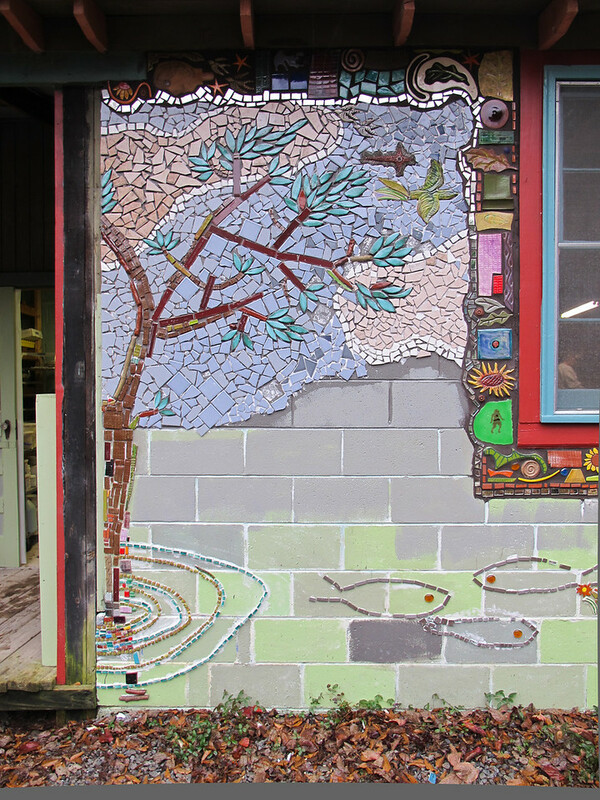 I saw folks working on it recently and they said it was the beginning of a community garden. Oh yay! 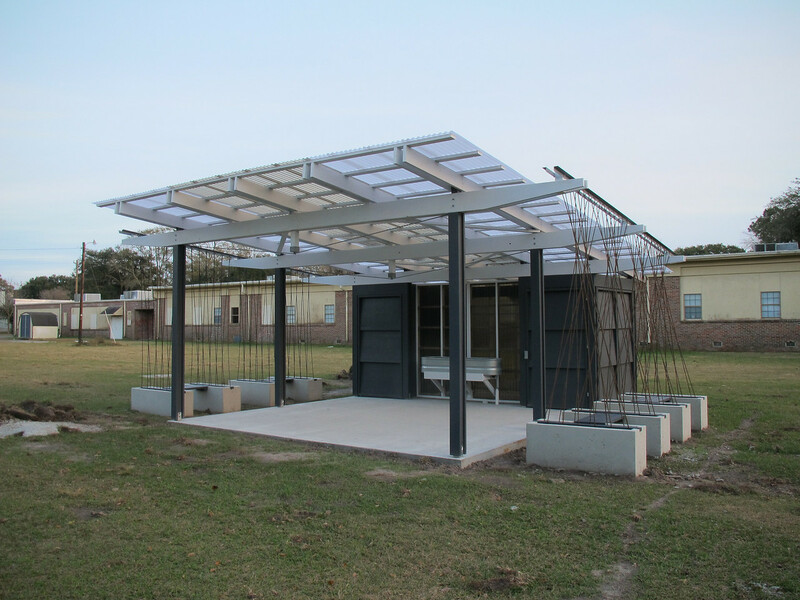 Their website says it is a Charleston Parks Conservancy project. 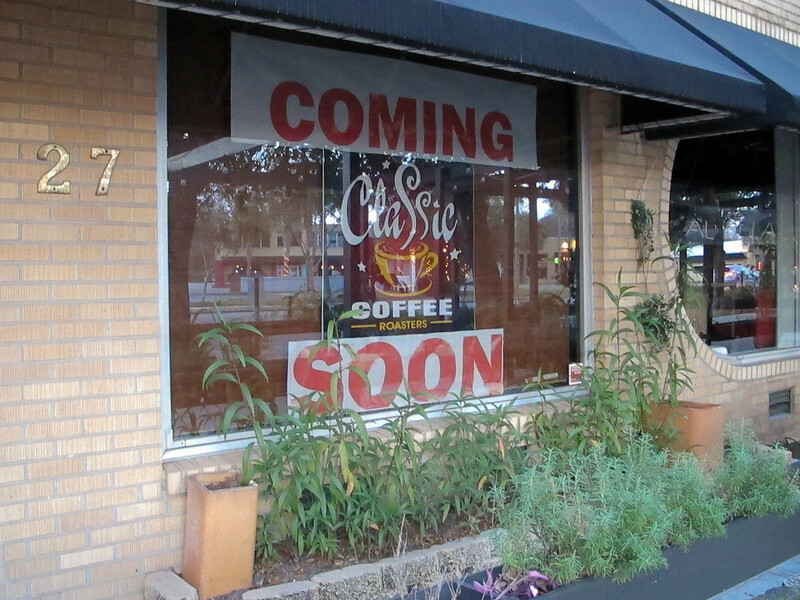 The bottom photo is a new coffee shop opening at 27 Magnolia Road next to Al Di La in Avondale. Their facebook page says they expect to open in January. Yipee! Who wants to meet me for coffee in 2014? All the best with your new businesses and welcome to the neighborhood! 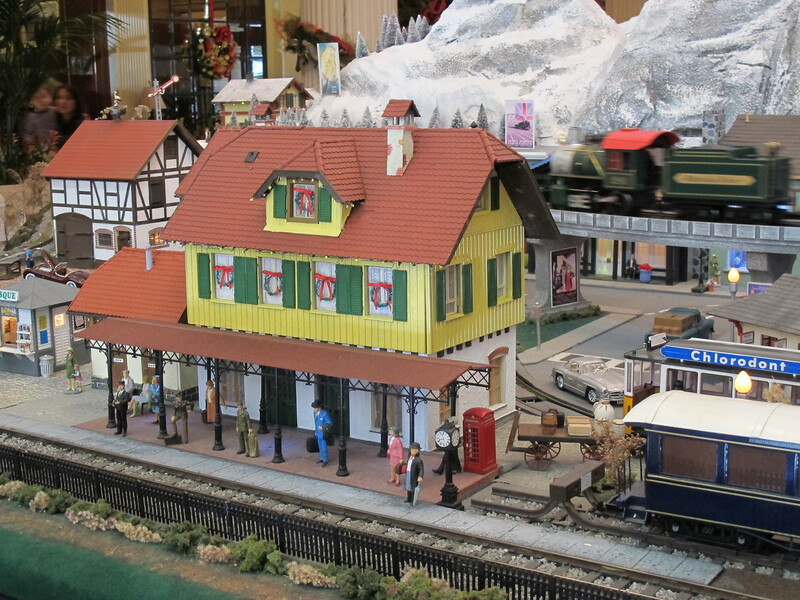 The train model set up at Charleston Place Hotel is a big hit every year. I love watching all the parents holding kids up to see the trains come by. I hope everyone had a good Christmas. I spent mine in a little cabin on Lake Marion. It was completely peaceful with no tv and occasional phone and wifi access. I took mostly prepared food up and we enjoyed a lazy Christmas morning reading and going for a walk. It was a bit too chilly and windy for the kayaks but a very pleasant place to be and for the last few years had been a tradition. I enjoyed coming back to see all the happy family pictures posted through the day on Facebook. I have one more completely free day. What shall I do with it?! 'Twas the night before Christmas. Charleston, S.C. 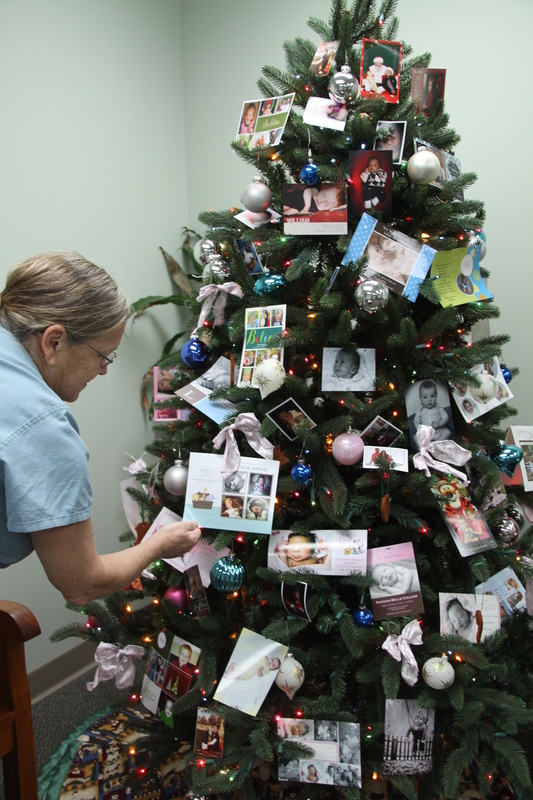 The babies in the newborn nursery are in good company today. 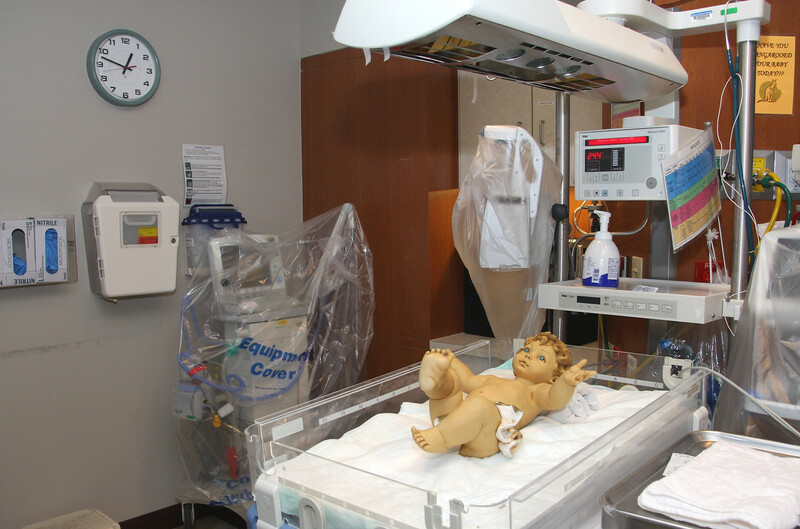 According to our hospital tradition Baby Jesus waits in the nursery crib until midnight when He is carried out and laid in the manger. 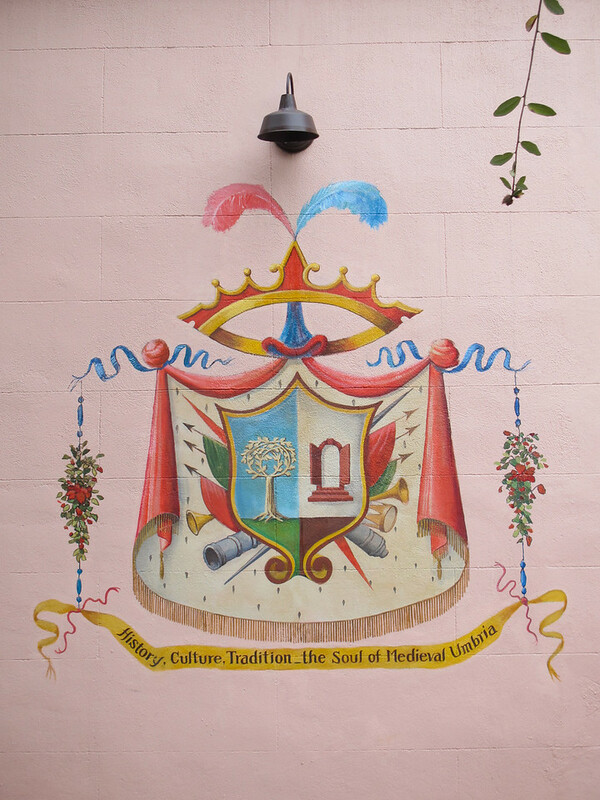 Mural on Burns Lane, Charleston, S.C.
Is nothing sacred? 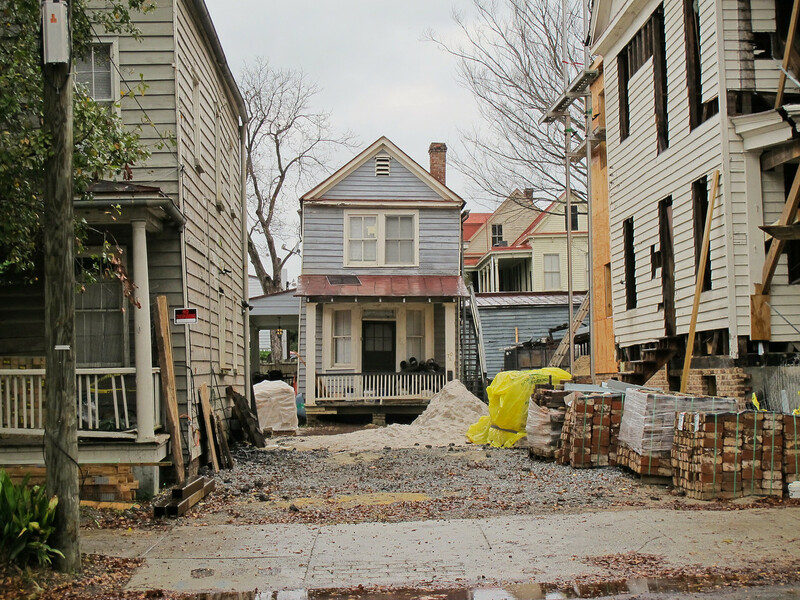 Even the back alleys in Charleston are getting spruced up. Check this out! 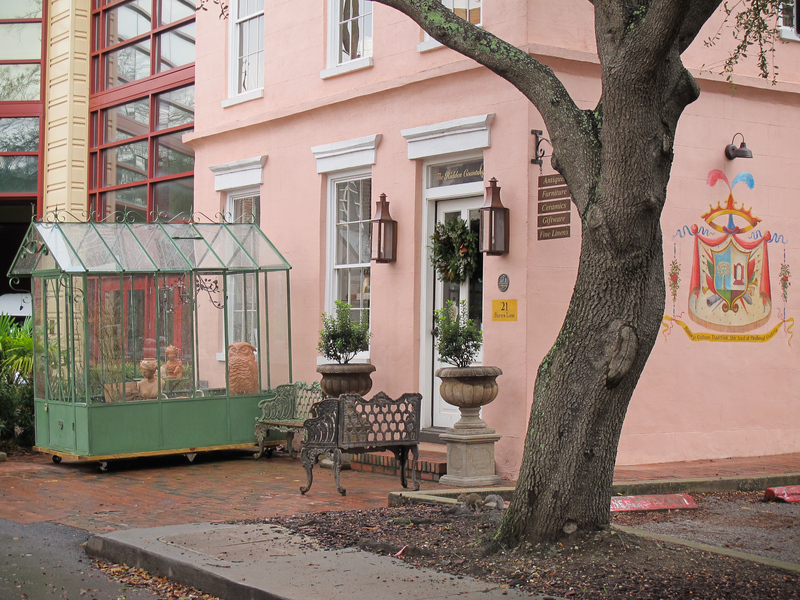 I spotted the little greenhouse as I wandered down King St. one day and followed it to come across this new shop called the Hidden Countship. It wasn't open when I was there but I was able to peek in the windows. They do have a good web site and blog so was able to get a closer look at some of the items I spied on. Has anyone been inside? I am off for a quick walk to see what I can do about all the department parties I visited last week at the hospital. I hit the macaroni and cheese and taste tested brownies in every one. Ouch. Here is another entry in our teeny, tiny houses of Charleston collection. 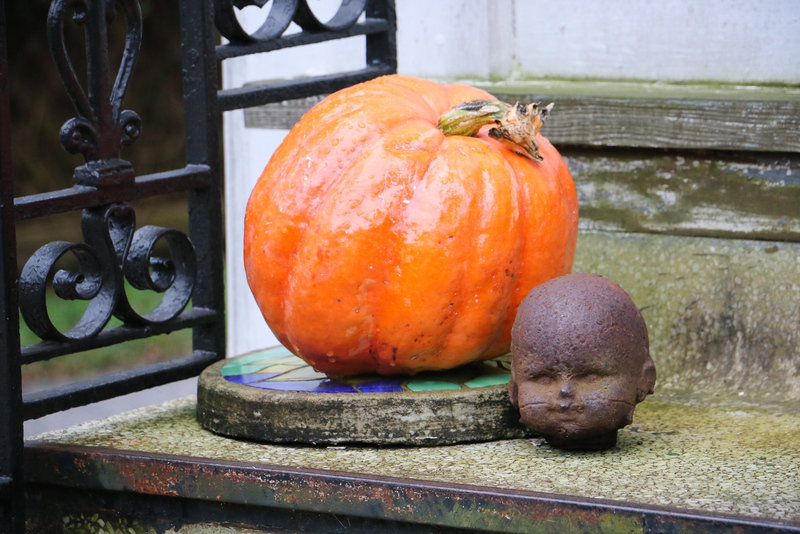 This sweetie is hardly noticed because it is hidden behind two large homes. Since the one on the right is undergoing a major and long overdue renovation project it has cleared the view for the time being. It would be nice if this little darling was next in line for some tender, loving care. 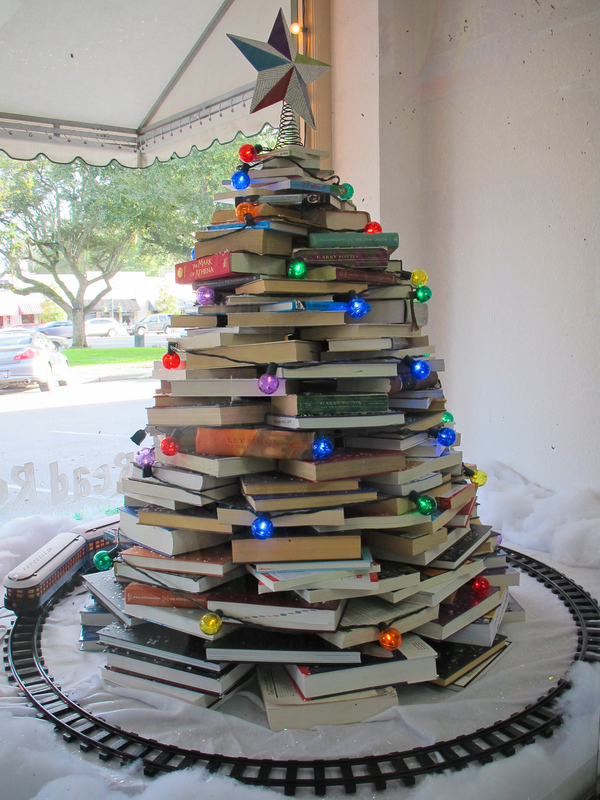 A Very Little Bookstore - Book Tree, Summerville, S.C.
What other cool theme trees am I missing? 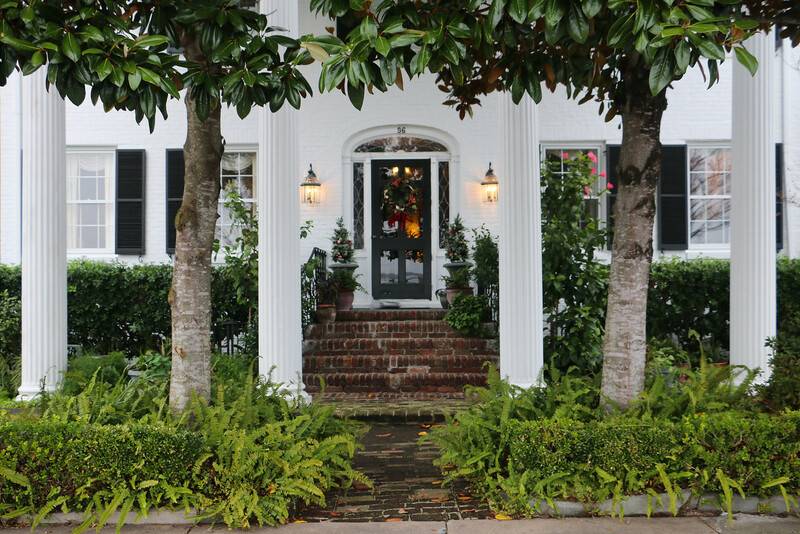 One of the coolest entrances in Charleston. Isn't this different? 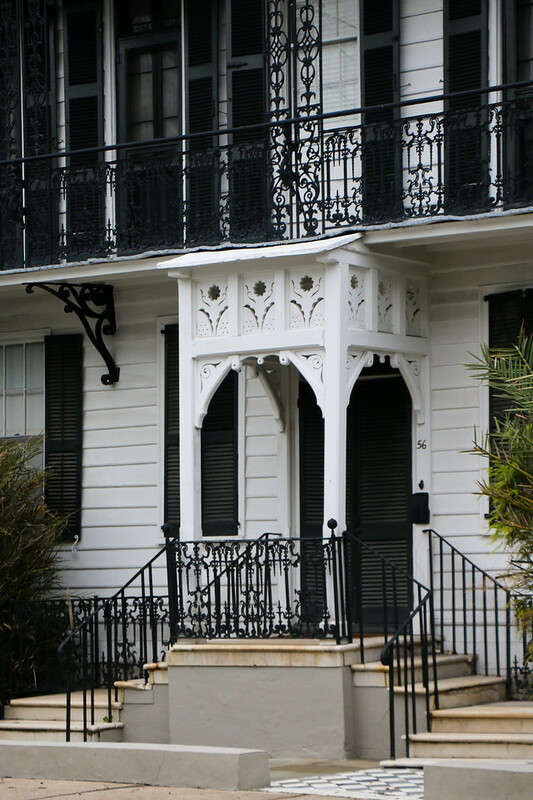 Interesting woodwork as well as great iron work. It's been happy chaos at work this week. 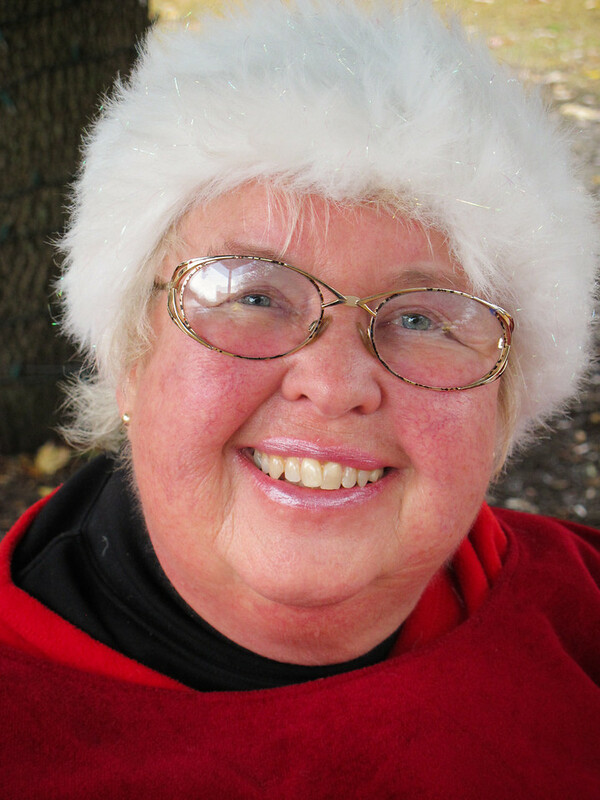 I've had holiday luncheons for volunteers at Roper Hospital, Mount Pleasant Hospital, St. Francis Hospital, the Patient Representative Volunteer group. 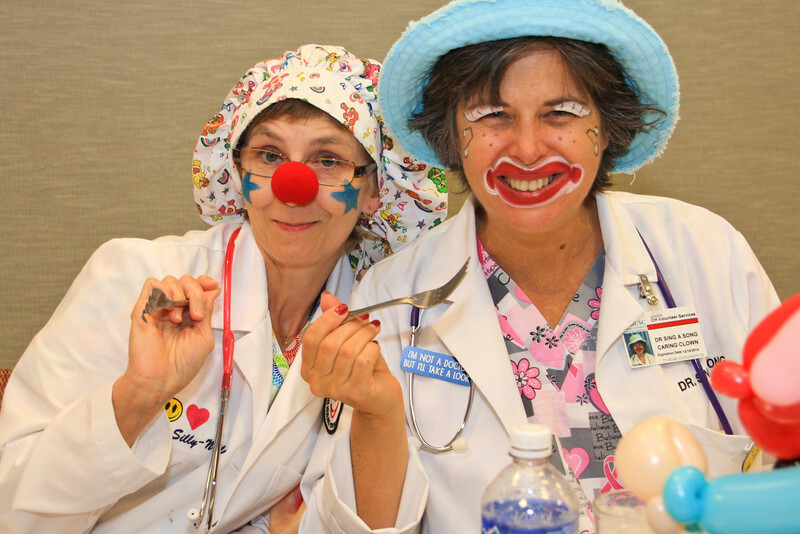 One more luncheon tomorrow when the Ambulatory Care nurses cook for their volunteers and those ladies can cook! I may need to be carried out of the hospital. As 2013 ticks away, it's the perfect time to take stock of the year gone by. 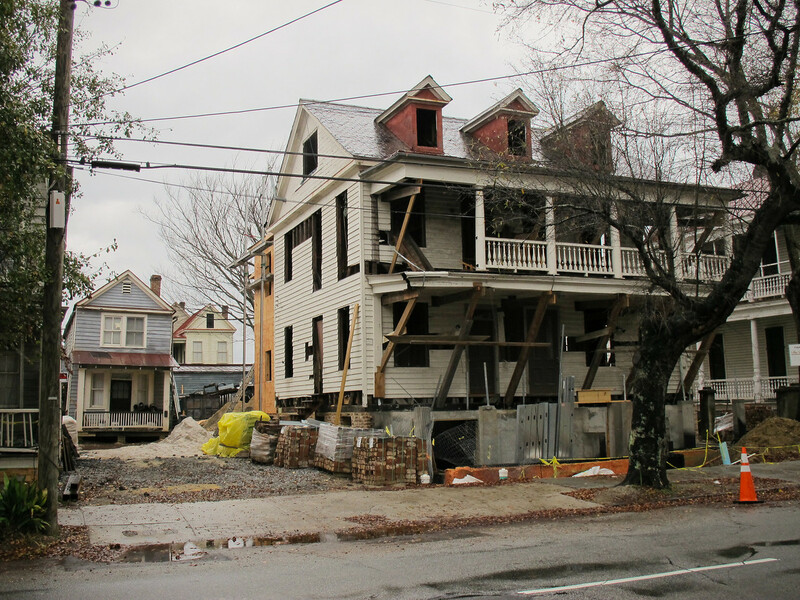 Sure, Joe Riley is still mayor and the Crosstown still floods, but 2013 had its moments, so we're switching things up for Best of Charleston 2014. We're pretty excited about it and think you will be too. Here's the deal: From December 18-January 10, we will accept nominations for Best of Charleston 2014. 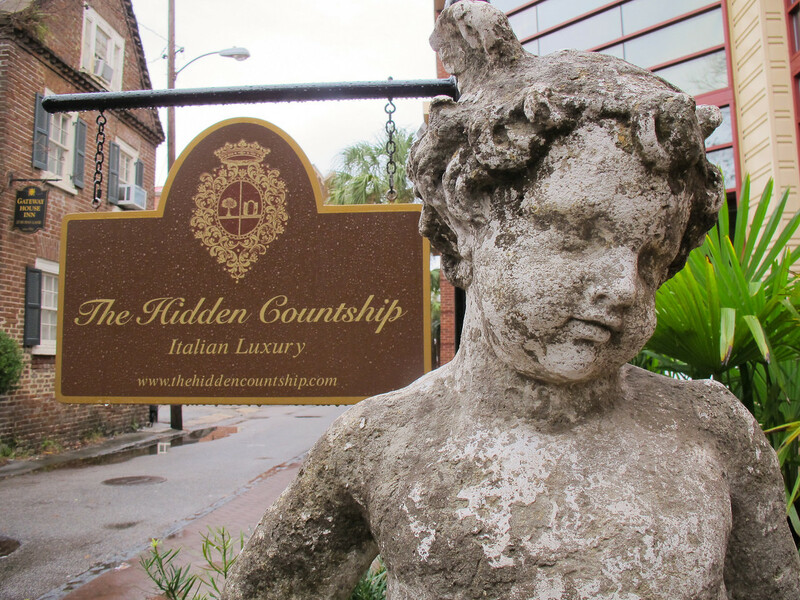 We'll tally up the top four nominees, toss in the 2013 winner and from January 15–February 4, you'll come back right here and cast your vote from those five nominees to crown the Best of Charleston 2014. So go ahead and get nominating! Hmmm....there is a different system to vote for the Charleston City Paper's Best of Charleston this year. The form starts off by asking for nominations to go on the voting ballot. It lists last year's winner and then we have the chance to toss in our nominations so there could be some new names in the hat. Here is the link. Go for it! Although most of my readers are from "off" and don't vote for City Paper's winners, do feel free to write Charleston Daily Photo in the Best Local Blog category. Who else should we write in to vote for? Have you been good, bad or Super Bad? 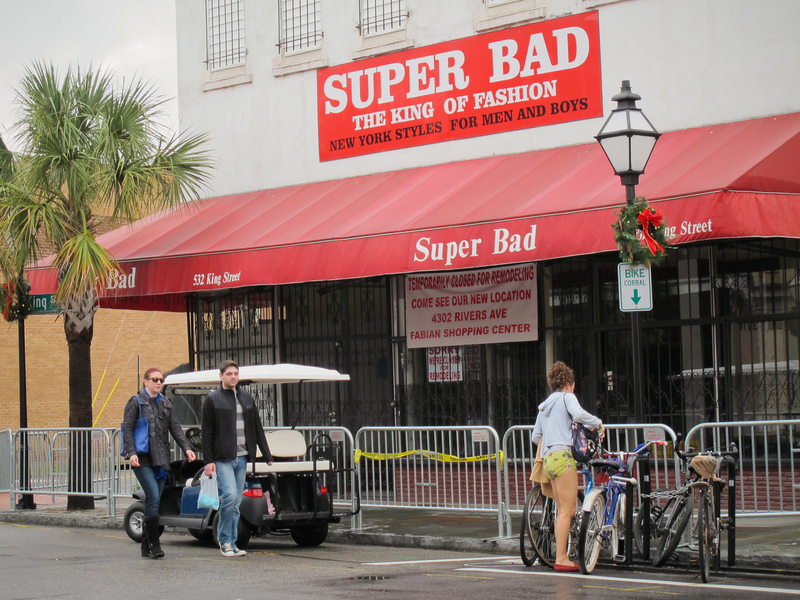 Super Bad, The King of Fashion, Charleston, S.C.
Good news, kids - the Super Bad, the King of Fashion store is being renovated.Some things are so much part of the King St. scene I'd be sad to lose them. One is the Super Bad. The other is the King of King himself, part of so many student's college experience, Byron. Things have been tough for the Best Street Character award winner lately. Curbside chiropractic discounted for the holidays. 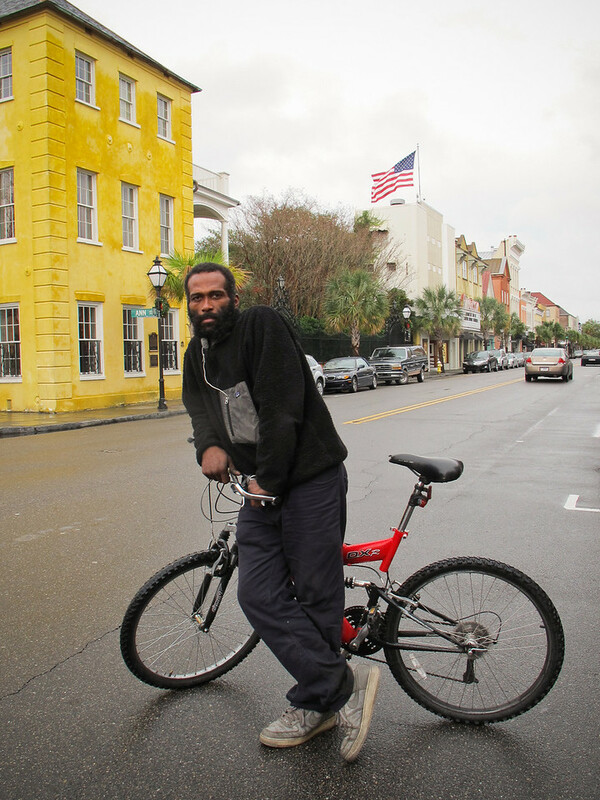 Fun note: Byron is the Man on the Street interview for the recent article on bustling growth on upper King St. Who better? 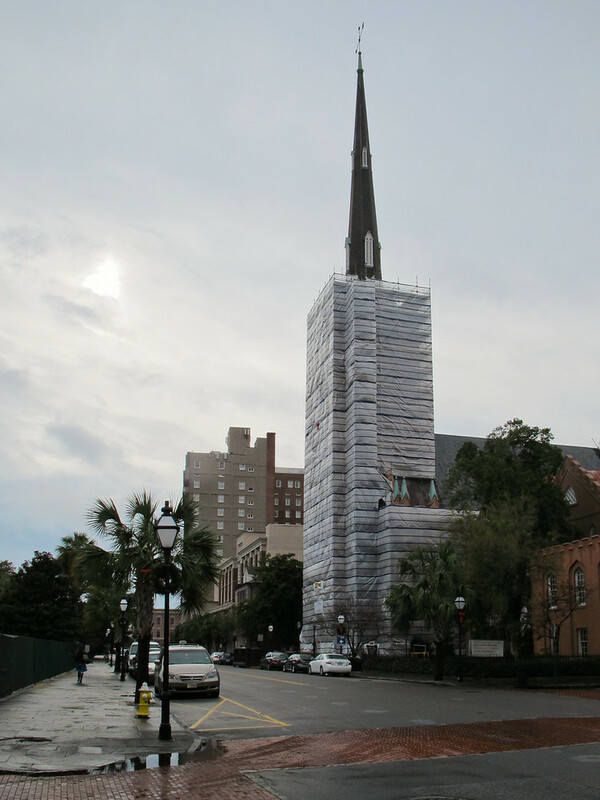 St. Matthew's Lutheran Church, Charleston, S.C. I'm done my wrapping! I wrapped an entire church for you and you can't unwrap it until Christmas morning. Wonder what they are doing to St. Matthew's Lutheran Church now? There always seem to be some renovations in progress on these old churches. Charleston has had some good job news lately! Yay, paychecks for everyone! Benefitfocus is adding 1,200 jobs on Daniel Island and Boeing is tripling it's presence. This is great news. 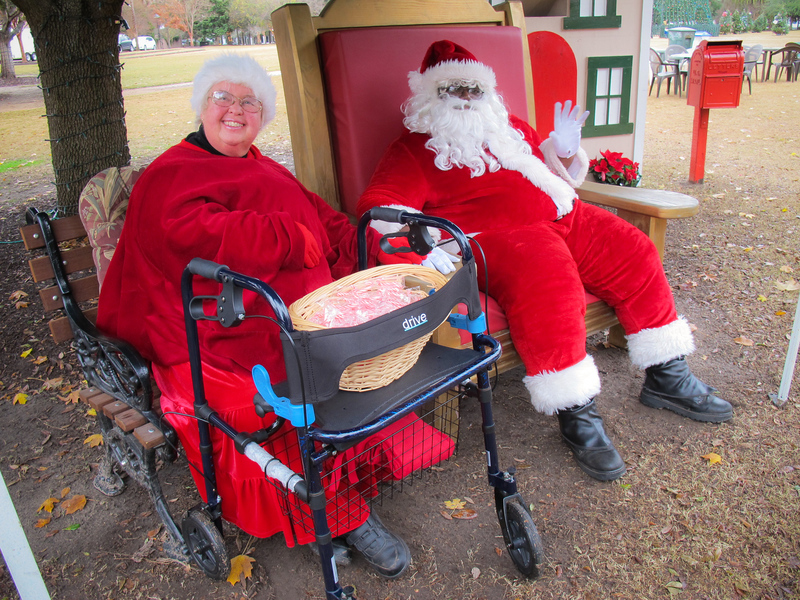 Santa & Mrs. Claus, Charleston, S.C. 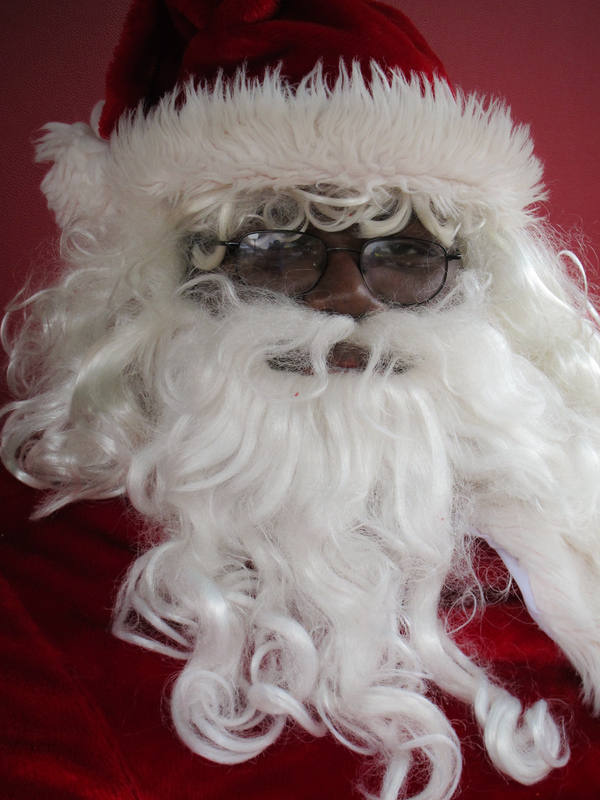 There has been some discussion lately about what race Santa is. It started after Fox news broadcaster Megyn Kelly pronounced him white, and continued to Jon Stewart on the Daily Show. 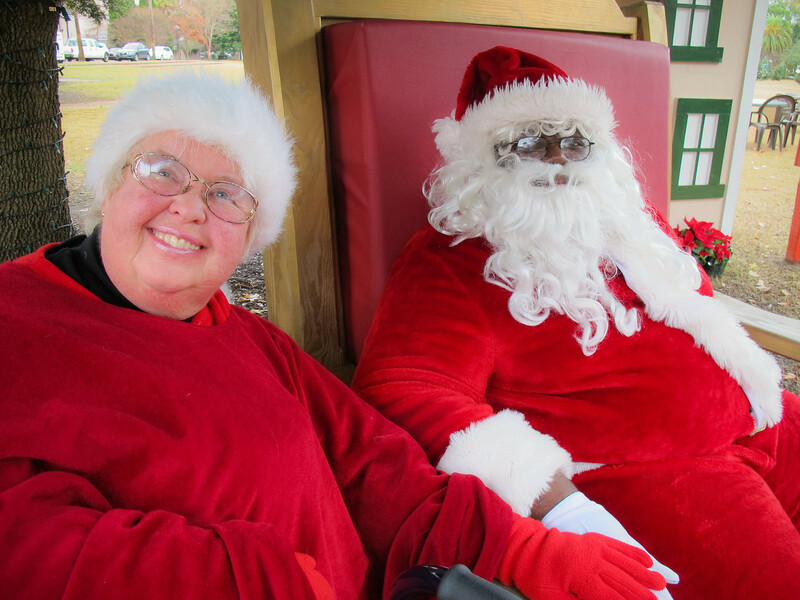 It made me very proud to find our Lowcountry Claus couple in place at Marion Square this morning, welcoming everyone with warm smiles and "ho, ho, ho's" on this drizzly day. Not only are they a mixed race couple but the Mrs. is using a walker this year. Thank you Charleston! I've been hesitant to do any yard work after a second episode of bad poison ivy happened after simply raking leaves. 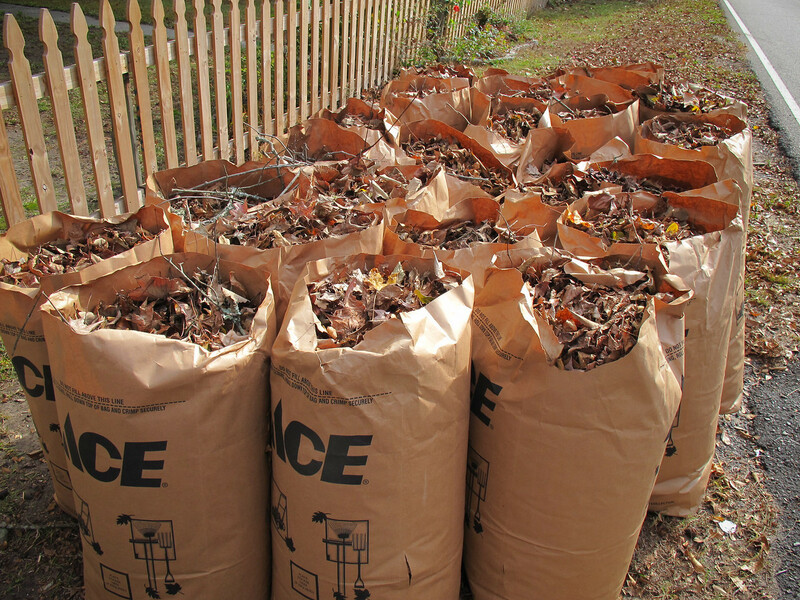 Meanwhile, although I have a small lot, I have a lot of leaves! I was in danger of having to dig my way out when two gentlemen swept in last weekend and cleaned me up. Wow. Look at all those leaves! I offered to pay them but they said that my friend Andre' had been good to them and they were happy to take care of me. My turn to pay it forward and I had their good deed in mind when I left an envelope with some $ yesterday to help a lady who feared eviction from her apartment before her unemployment check came in. I hope it helped. 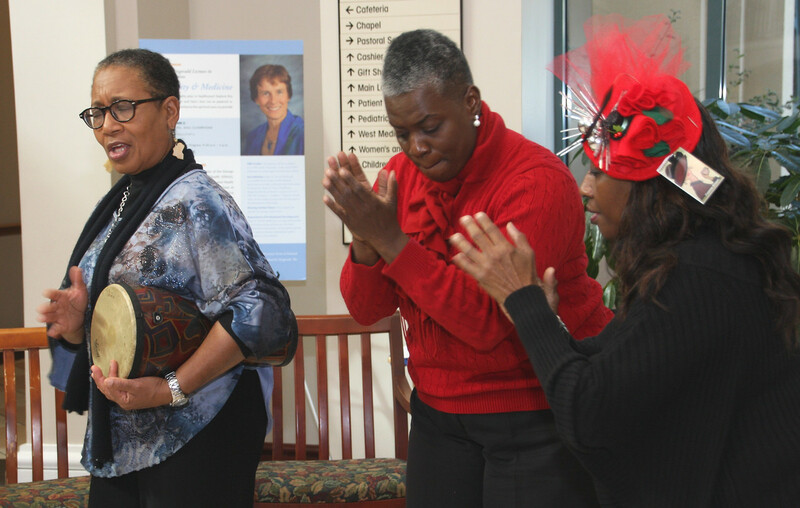 Choral Holiday Fun at Roper St. Francis Healthcare! This is the mischief I was up to last week! Enjoy! Thanks to Dr. Richard Ulmer, Craig David, Cheri McElwee, the Lowcountry Senior Center Choir and all my talented friends! 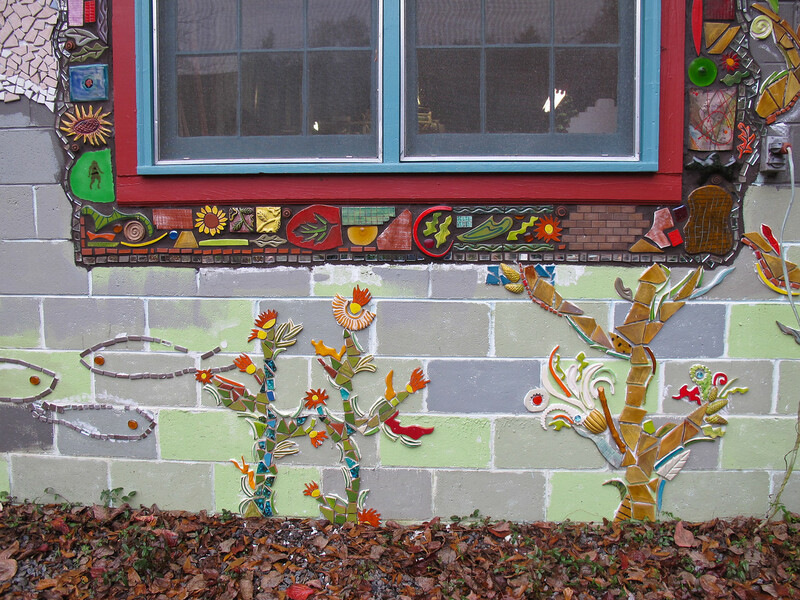 Isn't this the coolest mosaic? I have a cinder block house. Maybe I should do this on the back wall. I love it. 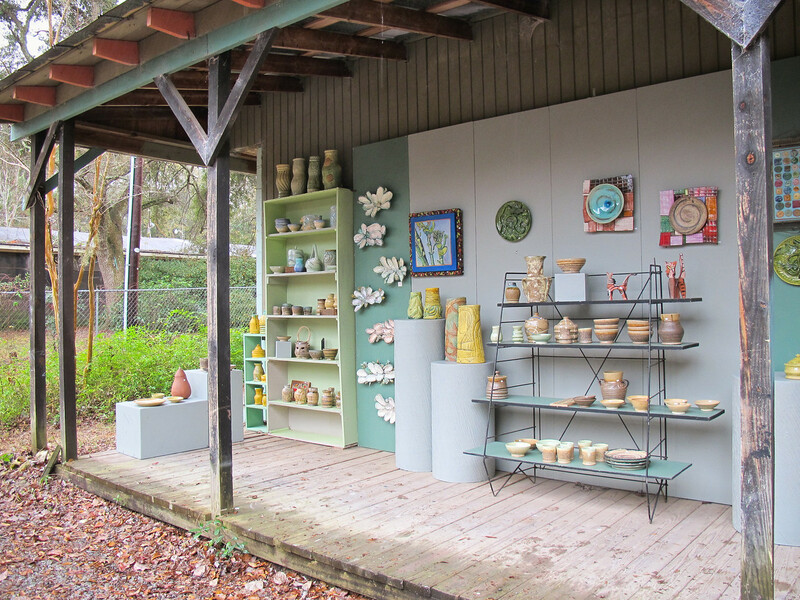 A friend of mine tipped me off to the fact that a couple of artists/potters were having an open house this past weekend and I crashed the party to snoop around. Cool stuff! In other news, what would you do for $5? Fiverr is a site where people will tell you what they can do for you for $5. From web help, caricatures to simply answering questions. I think it is a cool idea. I just paid $5 to have myself turned into a Simpson's caricature. We will see how that works. 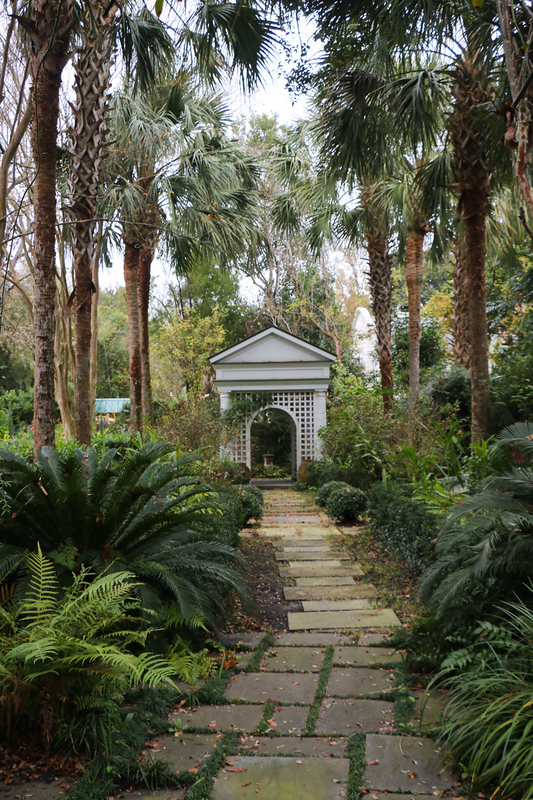 This is one of these pretty secret gardens behind a gate in downtown Charleston that is hard to believe as I watch the cold front sweeping the country on the news. We have had some gray days in the lowcountry but have nothing compared to the snow storms everyone else is getting. Brrrr. I just got back from hosting a career evening for twenty five young aspiring Pharmacists. 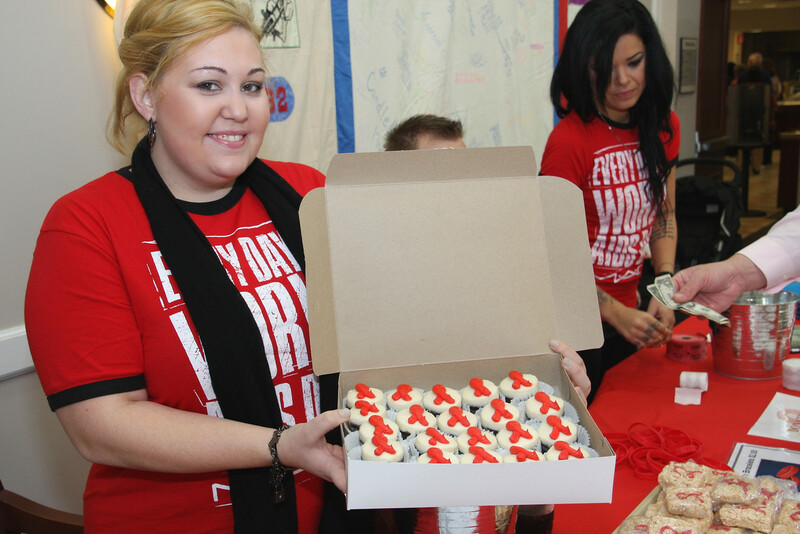 The Pharmacy staff tends to teach their lessons with edible snacks - they teach compounding with icing and food coloring. Yum! It's the only educational program I do where the students get to eat their work. 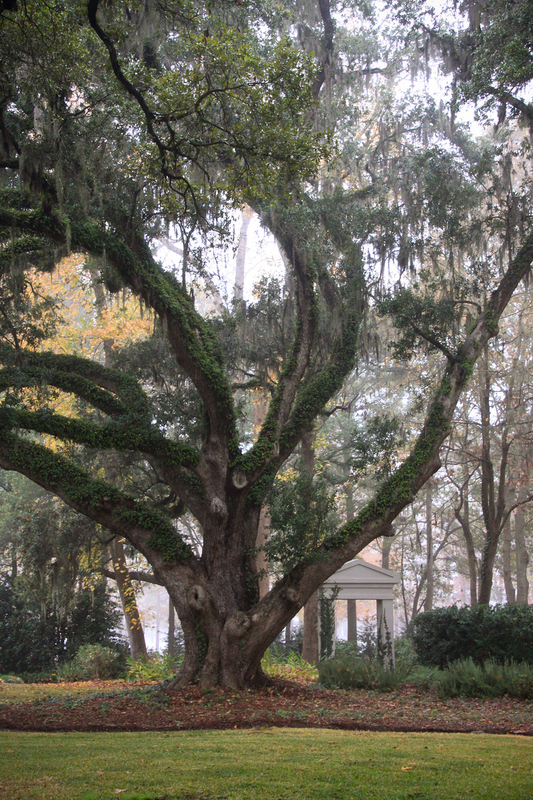 Foggy morning in Charleston, S.C. These foggy mornings have all of us reaching for our cameras. 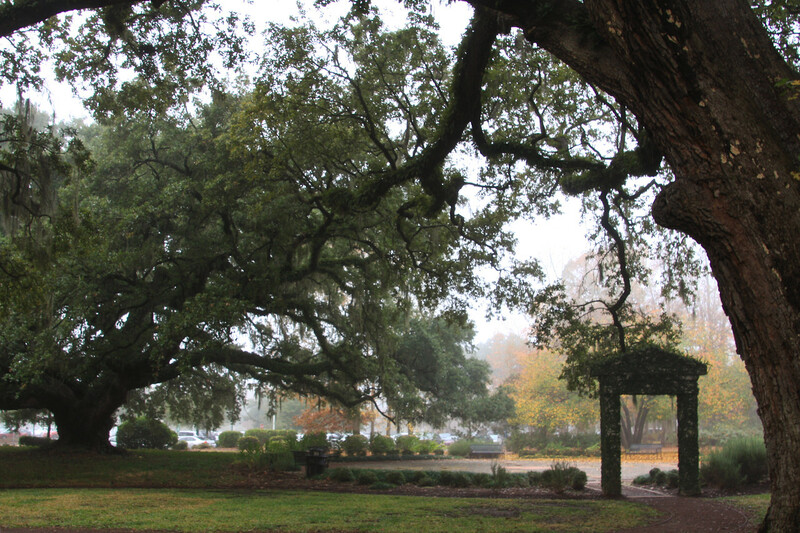 The fog had almost lifted by the time I got West Ashley but this is from my walk across the parking lot to the hospital. 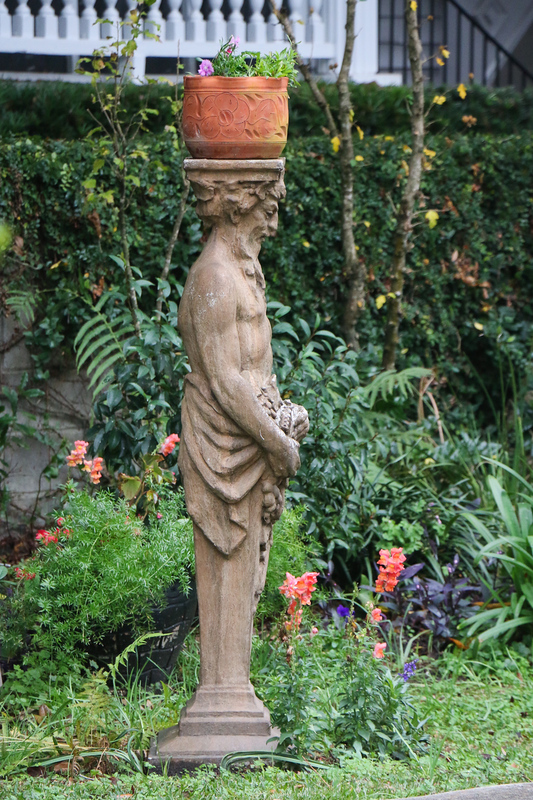 Our garden with it's giant oak trees is one of the most beautiful places on earth. I have ginger snaps in the oven and it's smelling pretty good in here! 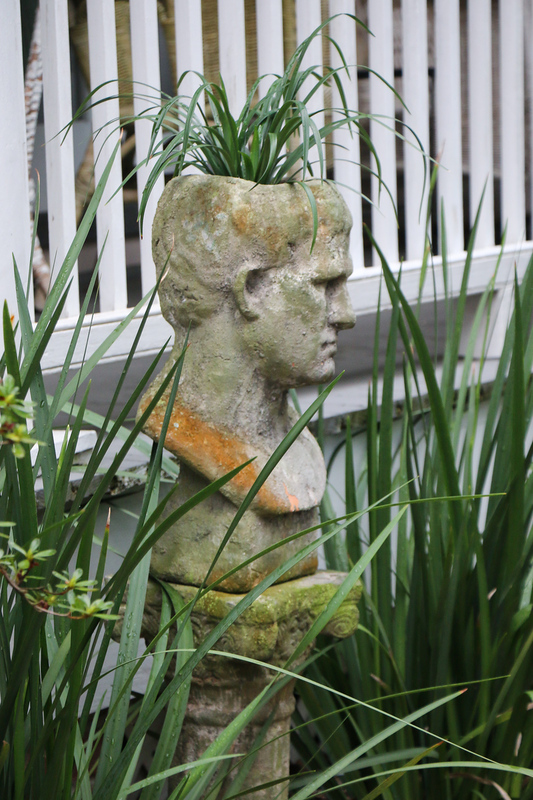 A head for decor on Queen St.
Queen St. Garden, Charleston, S.C. It didn't take long walking down Queen St. to realize there was a trend - a head trend! That third shot had me laughing! Not sure how to explain it. 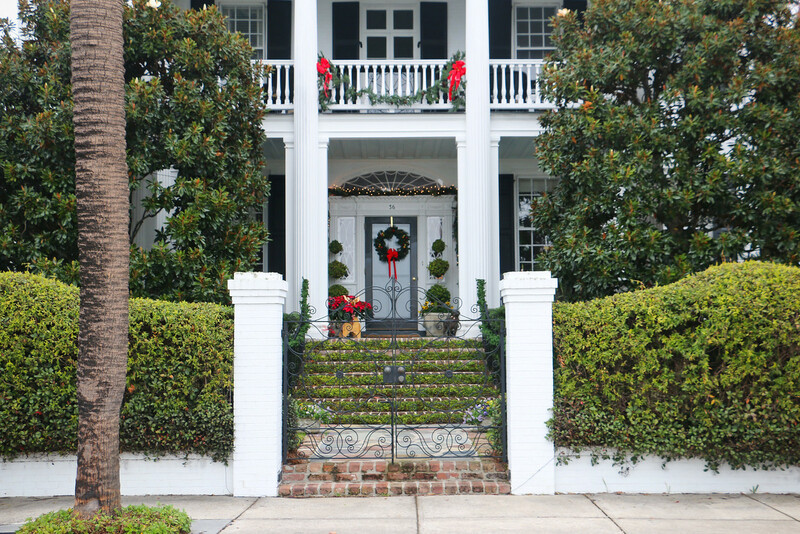 A reader emailed asking if I had Charleston Christmas cards from any of my pictures and not only do I not, I didn't even have any seasonal photos for this year. Thanks to this morning's walk I do now. Here is a start with more to come. Want more now? 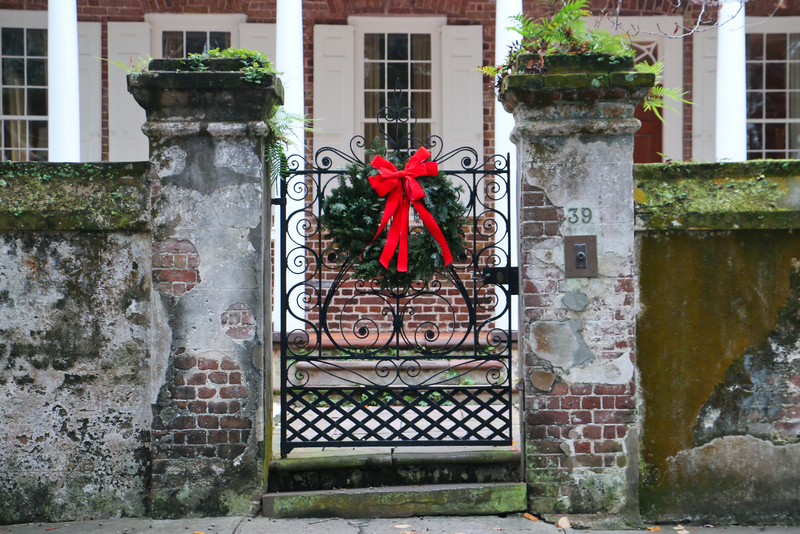 You can check this album of Charleston Christmas pictures from past years. Enjoy! Meanwhile, who has the best Caramel Cake recipe? I am feeling ambitious. 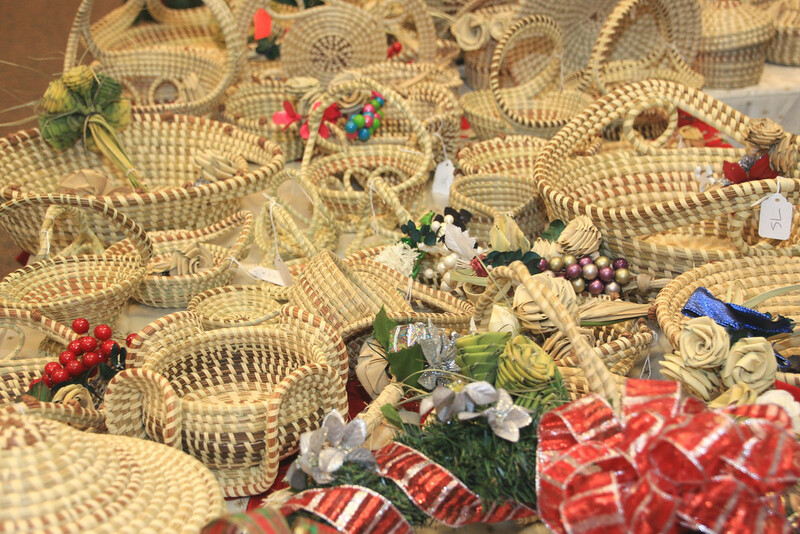 Holiday Sweetgrass Baskets, Charleston, S.C.
Charleston is famous for sweetgrass baskets and I have a secret connection. 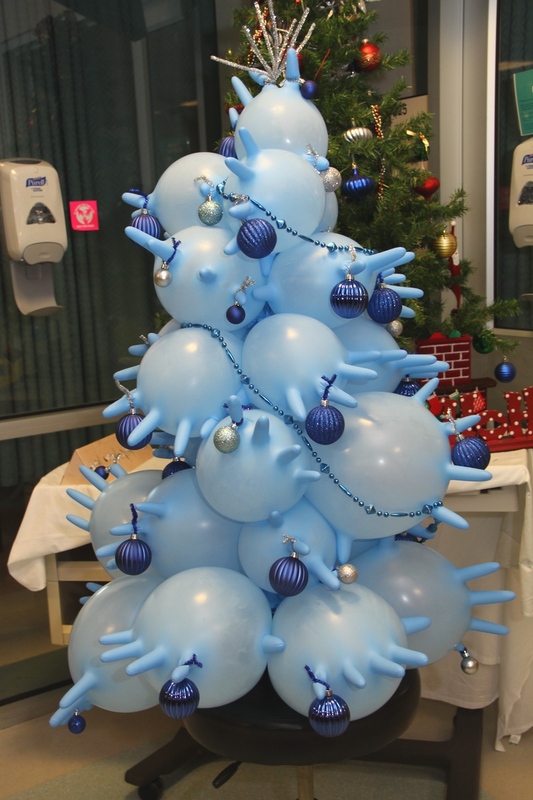 My friend Sandra had a booth at the hospital's employee craft sale today. Whenever I need something special for a gift or wedding present I ask her to bring me something in the price range I can afford. They are not cheap but everyone in the lowcountry appreciates the value of a beautiful sweetgrass basket. 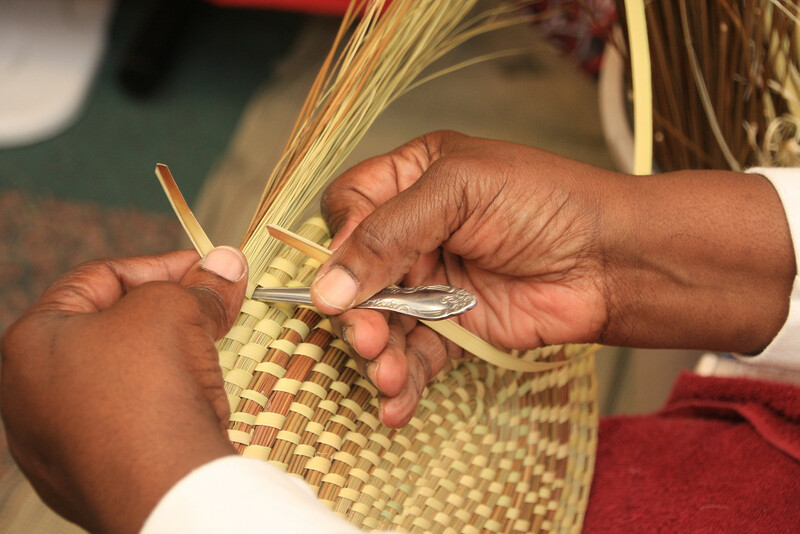 The basket making method came from Africa with the slaves and is passed down in families to this day. Youth Appreciation Banquet, Charleston, S.C. 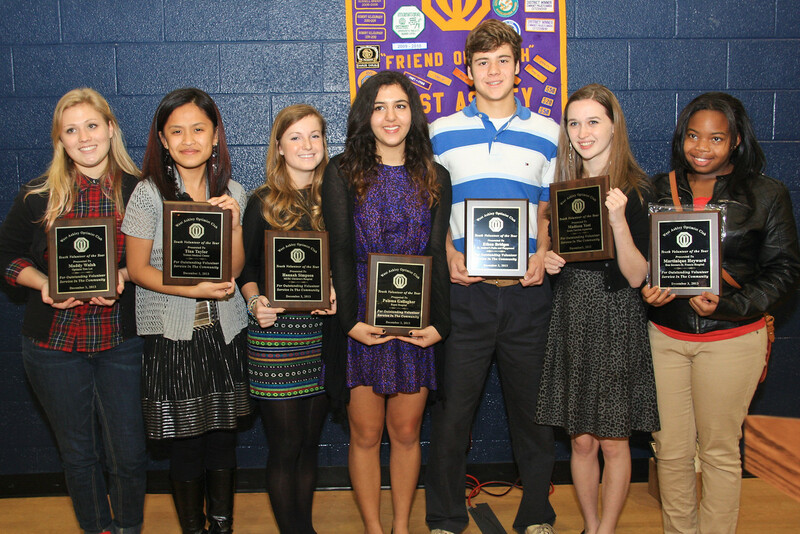 The West Ashley Optimist Club held their annual Youth Appreciation Banquet last night. I am always pleased to have the chance to nominate one of my student volunteers for recognition. My honoree is the gal on the far right. Not only did she volunteer all summer but after taking a CPR class went home and recognized that her own father was having a stroke and kicked into action to get him prompt treatment. I was proud as punch. We have some amazing young people in the lowcountry. Congratulations! 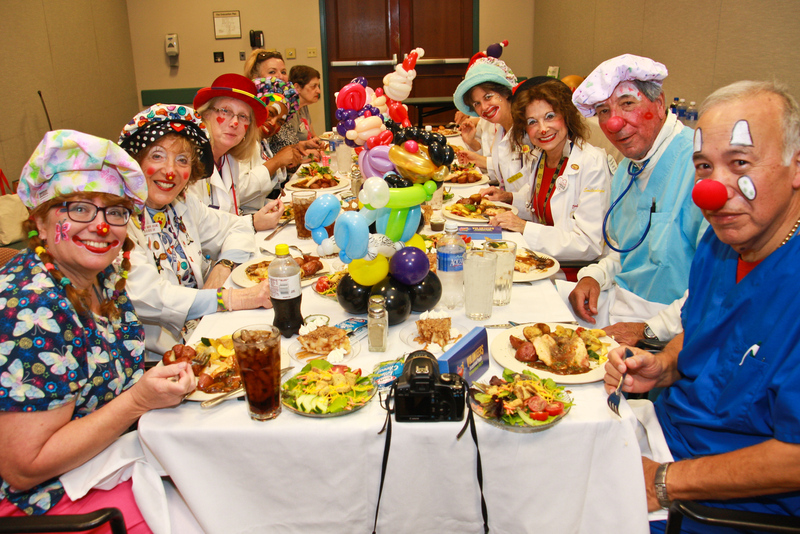 Caring Clown dinner, Charleston, S.C. I've attended a couple of events today but this was indeed the most colorful! 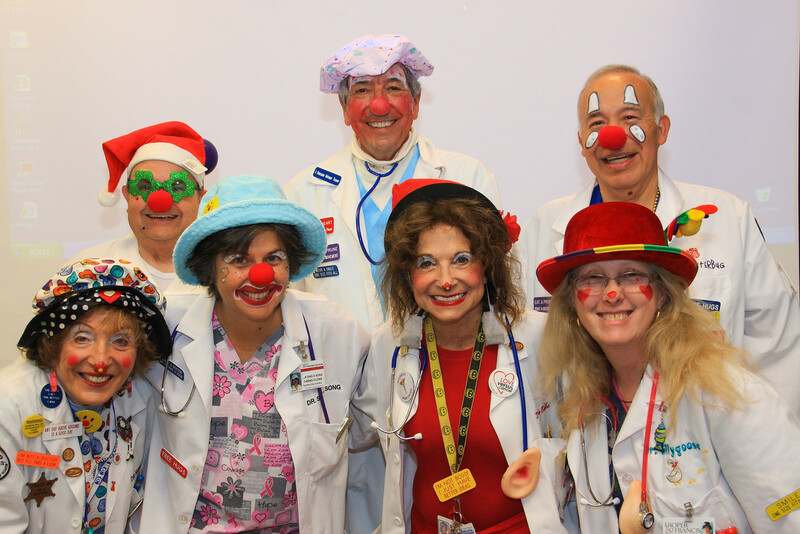 The Caring Clown program of healthcare volunteers had a meeting at the hospital this evening. Do ya think they shared a few laughs? 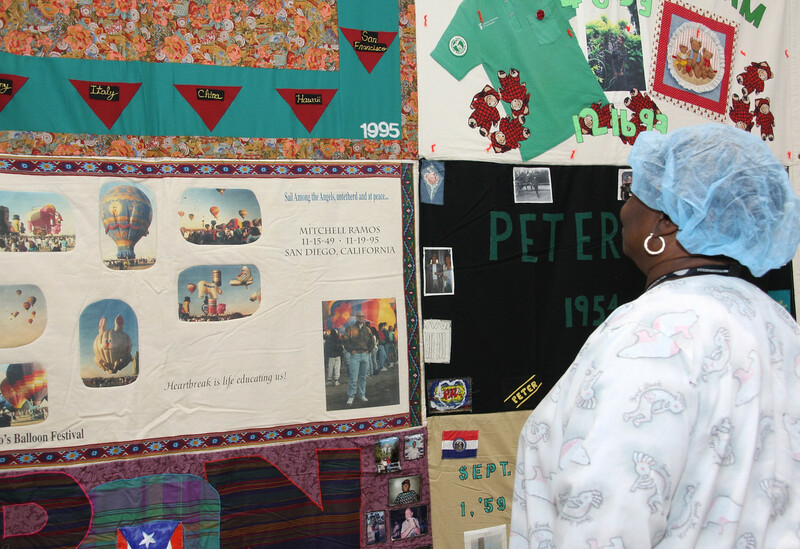 AIDS Quilt Display, Charleston, S.C.
We always get a few panels of the AIDS quilt to display on World AIDS Day. It was especially personal because one of the names commemorated in the quilt had my last name. Also, I watched the Dallas Buyers Club this past weekend that was a reminder of the early days of AZT and any hope of treatments. We've come a long way but not quite far enough. This is a good annual reminder and Ann Caldwell and her group came out to provide entertainment.